Filter Holdings offers premium quality industrial filtration dust collection bags, cartridge filters and pleated bags in a variety of weights, compositions, finishes and surface treatments. Options for high performance treatments are available, depending on the application. Whether you are installing a new compact dust collector, or retrofitting an existing baghouse with pleated bags because of space limitations or obstacles in your process plant, we can help. Filter Holdings fabricates an extensive line of industrial dust collection filter bags in a variety of woven and felted filter media. Dust collection filter bags are available for all types of baghouses including pulse jet, reverse air and shaker designs. With filter bags available in standard or static conductive fabrics, we also offer high performance fabric finishes, including our Unipore expanded PTFE surface treatment, for filtration efficiency down to sub-micron levels. Dust collection filter bags can be laser cut to eliminate loose fibers and heat seamed to eliminate needle holes. Filter Holdings offers a wide range of closed or open end cartridge filters to be used in a variety of filter media either in tandem, or individually. 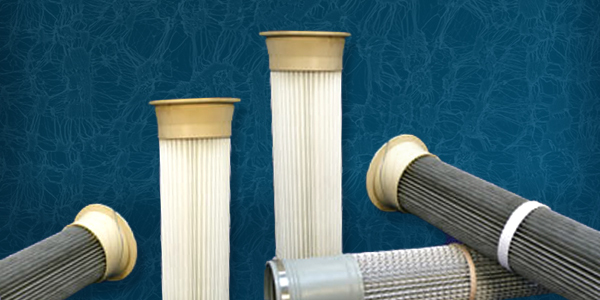 Pleated cartridge filters may offer advantages over standard filter media with improved dust retention rates as pleats increase the filtration surface area, and improve air flow. Our cartridge filters are available in standard dimensions, or cartridge filters can be custom-fabricated to meet the specific requirements of your application. Suitable for ambient or high temperature applications, our pleated filter bags are available for top load or bottom access dust collectors in many lengths, diameters, shapes, and pleat count. For ambient temperatures, we offer a variety of fabrics & finishes including our Unipore surface treatment in standard or static conductive media. For high temperature applications, various types of Nomex®, PPS and PTFE are available. As a companion to pleated bags, we offer innovative ‘blank-off’ elements for increased bag separation for light weight non-agglomerating dust streams.